Tamarind Fruit is sponsored by iTi Tropicals, Inc.
Of all the fruit trees of the tropics, none is more widely distributed nor more appreciated as an ornamental than the tamarind, Tamarindus indica L. (syns. T. occidentalis Gaertn. ; T. officinalis Hook. ), of the family Leguminosae. Most of its colloquial names are variations on the common English term. In Spanish and Portuguese, it is tamarindo; in French, tamarin, tamarinier, tamarinier des Indes, or tamarindier; in Dutch and German, tamarinde; in Italian, tamarandizio; in Papiamiento of the Lesser Antilles, tamarijn. In the Virgin Islands, it is sometimes called taman; in the Philippines, sampalok or various other dialectal names; in Malaya, asam jawa; in India, it is tamarind or ambli, imli, chinch, etc. ; in Cambodia, it is ampil or khoua me; in Laos, mak kham; in Thailand, ma-kharm; in Vietnam, me. The name "tamarind" with a qualifying adjective is often applied to other members of the family Leguminosae having somewhat similar foliage. 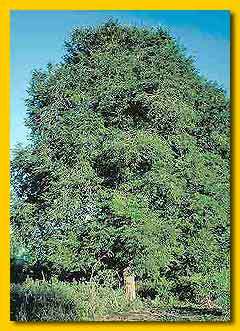 The tamarind, a slow-growing, long-lived, massive tree reaches, under favorable conditions, a height of 80 or even 100 ft (24-30 m), and may attain a spread of 40 ft (12 m) and a trunk circumference of 25 ft (7.5 m). It is highly wind-resistant, with strong, supple branches, gracefully drooping at the ends, and has dark-gray, rough, fissured bark. The mass of bright-green, fine, feathery foliage is composed of pinnate leaves, 3 to 6 in (7.5-15 cm) in length, each having 10 to 20 pairs of oblong leaflets 1/2 to 1 in (1.25-2.5 cm) long and 1/5 to 1/4 in (5-6 mm) wide, which fold at night. The leaves are normally evergreen but may be shed briefly in very dry areas during the hot season. Inconspicuous, inch-wide flowers, borne in small racemes, are 5-petalled (2 reduced to bristles), yellow with orange or red streaks. The flowerbuds are distinctly pink due to the outer color of the 4 sepals which are shed when the flower opens. The fruits, flattish, beanlike, irregularly curved and bulged pods, are borne in great abundance along the new branches and usually vary from 2 to 7 in long and from 3/4 to 1 1/4 in (2-3.2 cm) in diameter. Exceptionally large tamarinds have been found on individual trees. The pods may be cinnamon-brown or grayish-brown externally and, at first, are tender-skinned with green, highly acid flesh and soft, whitish, under-developed seeds. As they mature, the pods fill out somewhat and the juicy, acidulous pulp turns brown or reddish-brown. Thereafter, the skin becomes a brittle, easily-cracked shell and the pulp dehydrates naturally to a sticky paste enclosed by a few coarse strands of fiber extending lengthwise from the stalk. The 1 to 12 fully formed seeds are hard, glossy-brown, squarish in form, 1/8 to 1/2 in (1.1-1.25 cm) in diameter, and each is enclosed in a parchmentlike membrane.